Entrance to the castle is heavily guarded. The massive entrance hall with arch support columns. 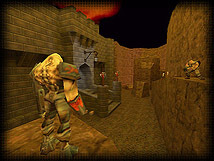 Citing "the incredible Hexen 2 mod - Siege" as his source of inspiration, Kevin Hall has crafted an impressive debut level. 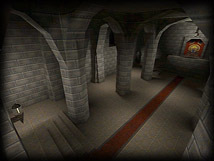 With its medieval setting and appropriate matching architecture, Hexorcism is an exciting departure in style from the usual Quake 2 base theme. Architecture is very well done, in fact it is at times stunning. The entrance hall just inside the main doors is a good example. Consisting of a large open room with massive yet graceful arches, a long regal stretch of carpet and deep mysterious shadows, gameplay takes on a whole new feel. Another area of note is the spiral staircase, a very well constructed and fun combat setting. While the architecture is a pleasure to gaze upon, it is matched by solid and challenging gameplay. Keven has also a few surprises in store for you. Of particular note is the arena. Recessed into the floor and flanked by rows of stadium type bleachers, you drop down preparing yourself for whatever is to follow. At first nothing happens, but then the lights go out and are replaced by a red strobe as two spotlights point to two side doors...and then the doors open. A remarkable and memorable sequence of events! 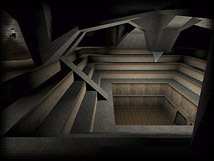 The only snag that could throw some gamers off is the diabolical puzzle of the security access card (which clears your way to the room at the top of the spiral stairs). The switch needed to gain access to the security card is at an illogical location which also requires speed and agility to complete. Not a bad thing once you figure it out...but a source of frustration until (if) you do. But don't let this one detail put you off from downloading this masterful level, Hexorcism is a "must add" to your collection. Well done medieval architecture, gotta love that arena! Security Card Access could put off the casual gamer. An impressive debut level that looks and plays like an old pro. Get it now!